Do you want to gain powerful techniques for your clients who struggle with treatment resistant anxiety, worry and panic? Learn how to assess anxious habits, symptoms and behaviors using effective cutting-edge, evidence-based strategies…even with your toughest clients! Dr. Jennifer Abel will teach you how to stop the anxiety spiral early to significantly reduce the habit of worry and panic using self-controlled desensitization. Experience how evidence-based treatments can help your clients problem solve, reduce tension, and increase energy. Learn unique, effective approaches to mindfulness, cognitive therapy, and exposure, including thought-labeling, interoceptive exposure, and better-but-believable thoughts. Case studies, role plays, demonstrations and interactive discussions will be utilized in this cutting-edge seminar. Articulate components of the “anxiety spiral” and utilize several evidence-based strategies (including self-controlled desensitization) to prevent exacerbation of symptoms. Specify five potential anxiety treatment pitfalls and learn evidence based approaches to avoid or correct them. Implement four mindfulness strategies for treating anxiety symptoms in a clinical setting. Evaluate the inverse relationship between worry and problem solving, and identify its implications for treatment of anxiety. Examine the clinical presentation of panic, worry and fear of guilt and how they compare to Obsessive Compulsive Disorder; learn clinical strategies to stop these cycles of negative reinforcement. Develop clinical skills to address treatment-resistant issues, including perfectionism, subjugation, procrastination, hypochondriasis, and catastrophizing/intolerance of uncertainty. 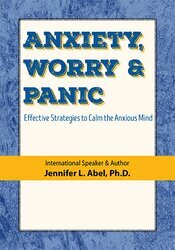 Jennifer L. Abel, Ph.D., international speaker, author and clinical psychologist, has specialized in the treatment of anxiety disorders for over 20 years. Before opening a private practice, she served as the associate director of the Stress and Anxiety Disorders Institute at Penn State under the direction of the leading expert in Generalized Anxiety Disorder (GAD), T.D. Borkovec. Her first book, Active Relaxation (Self-Published, 2010) has received outstanding reviews from mental health care professionals and anxious readers alike. Her second book, Resistant Anxiety, Worry, and Panic: 86 Practical Treatment Strategies for Clinicians (PESI, 2014), has received praise from top experts in anxiety management. Jennifer is also the author of The Anxiety, Worry & Depression Workbook: 65 Exercises, Worksheets & Tips to Improve Mood and Feel Better (PESI, 2018) and the Melt Worry and Relax Card Deck: 56 CBT & Mindfulness Strategies to Release Anxiety (PESI, 2016). Dr. Abel has published many articles in professional journals and wrote a pamphlet about GAD for ABCT. She has been quoted by several popular magazines (e.g., Health, Prevention, Glamour) for her expertise in Worry. Dr. Abel presents to the public (e.g., Working Women’s Survival Show), as well as professionals (e.g., Australian Psychological Society; Anxiety Disorder Association of America). Financial: Jennifer Abel is in private practice. She receives compensation as a self-published author. Jennifer Abel receives a speaking honorarium from PESI, Inc. Non-financial: Jennifer Abel has no relevant non-financial relationship to disclose. PESI, Inc. is an AOTA Approved Provider of continuing education. Provider #: 3322. This self-study course qualifies for 6.0 self-study contact hours or .6 CEUs in the Category of Domain of OT and Occupational Therapy Process. The assignment of AOTA CEUs does not imply endorsement of specific course content, products, or clinical procedures by AOTA. Course Level: Intermediate. Expires: 10/12/2020. PESI, Inc. designates this enduring material for a maximum of 6.0 AMA PRA Category 1 Credit(s)™. This activity was originally recorded on 10/12/2018. It was last reviewed on 07/24/2018 and is valid until 07/24/2021. Physicians should only claim credit commensurate with the extent of their participation in the activity. PESI, Inc. is accredited by the Accreditation Council for Continuing Medical Education to provide continuing medical education. California Psychologists: PESI, Inc. is approved by the CPA OPD to sponsor continuing education for psychologists. Provider #PES010. PESI maintains responsibility for this program and its contents. PESI is offering this self-study activity for 6.25 hours of continuing education credit. Full attendance is required; no partial credits will be offered for partial attendance.